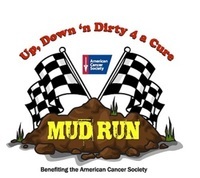 The Up, Down N Dirty 4 A Cure 5k Mud Run to benefit the American Cancer Society. This event will take place at the Perris Auto Speedway in Perris, California on June 8, 2019. Participants will be greeted by a course that will be set up with a variety of fun and challenging obstacles. Join us before your wave for fun, music, vendors and food or stay after you get Down N Dirty. We will also have a special area set up for all of the cancer survivors and caregivers that visit us during this event. We can't wait to see you all and hope to raise a lot of funds to fight cancer as we all get Dirty 4 A Cure! Run Day Registration Begins 7AM. Waves every 15 minutes, last wave 10am. Bring a change of clothes, Secured Bag Drop area, showers and changing areas. Lots of entertainment, bands DJ, Beer Garden, vendors and more………..
Perris Auto Speedway track, be prepared for lots of MUD and a minimum of 20 obstacles. Parking $8.00 per car CASH ONLY.